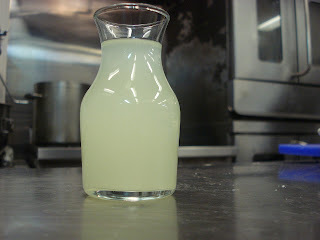 I've been enamored of the curdled/strained milk addition in cocktails ever since I made Italian Lemonade. It's often called for in milk punches, although bartenders tend to make milk cocktails to order. Shaken and consumed immediately, one often avoids curdling the milk, at least in the glass. But mixing the milk and citrus ahead of time, allowing it to curdle, then straining out the solids leaves the protein of the whey without the richness of the rest of the milk. One of the features of the Italian Lemonade is its incredibly low alcohol content. I wondered if I could harness the flavors but punch up the booze to make it a proper cocktail. Also, while making it, I had to strain it several times. But the mixture remained cloudy. Although the drink did not appear mottled and curdled, there was still a lushness that betrayed the dairy content. I wondered if I could remove all of the solids, and what the remainder would taste like. Rather than mix everything at once, I isolated the two components that cause the curdling: citrus and milk. I substituted lime for lemon, mixed them together, and waited until it was quite chunky. Straining required time and patience. A coarse sieve removed the bulk of the solids, then a tea strainer, then finally I wet a kitchen cloth, set it in a funnel and let the liquid slowly make its way through. Ultimately I was left with a greenish-clear substance that smelled kind of like a lime popsicle. I've been enamored of Marian Farms California Style Pisco since it became available last summer. The farm is located in the San Joaquin Valley and distills spirit from biodynamic Muscat and Thomson grapes in a copper pot still. The result is an unctuous, flavorful spirit with a lower phenol content than other Piscos I have tried, giving it a cleaner, more mixable quality. It lends a backbone to cocktails, yet is mild enough to let other delicate flavors come through. I think this is what some bartenders default to vodka for; they don't want the spirit to ruin the flavors they have put together. I try instead to match qualities of spirits to the qualities of the added ingredients. As much as I love agricole rhum, it would kill the nuances of this drink. And yet vodka would add nothing. This Pisco makes me happy. This cocktail does something I delight in: the ingredients mesh so that it is hard to identify any one thing. Various bartenders I have made this for asked if it had gin, or egg white, or rum. The foam created looks like egg white, but it's not as slippery. And the whey adds a familiar protein quality but having the rest of the milk removed makes identifying it elusive. I love this! 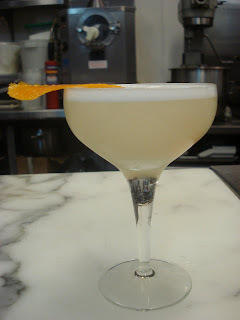 I submitted this cocktail to the guys at Left Coast Libations for their upcoming book. It's promising to be a very interesting collection of recipes from the specifically west coast style of bartending. I'll write about it more when it comes out. Shake all ingredients together vigorously in mixing tins. Double-strain into a chilled coupe. Garnish with an orange peel. *Mix 8 oz nonfat milk with 3 oz freshly squeezed lime juice. Let stand a few minutes to curdle. Strain through successively finer strainers, then pour through a wet kitchen cloth, letting stand until the clear liquid has filtered through. These Milk Punch things have intrigued me since I started reading about them, but since the batches are often quite large, never enough to risk making one. I recently read about a hibiscus and milk punch that the folks at Drink in Boston are making. I might try to get a batch done for next Sunday. It's funny -- I'm just starting to experiment with yogurt making, and usually discard whey after straining the yogurt. I wonder how much lime juice would be appropriate for bacteria-enhanced whey vs. the whey from freshly curdled milk. hey Jennifer, When making Whey with an acid I normaly heat up the milk. I like the idea of doing it cold to keep the protein chains intact. Question is: how long did it take to curdle sufficiently? Hey Jennifer, how long did it take to curdle sufficiently at room temperature? It took about 5-10 minutes, not too long. But lately I've been making traditional milk punches, and I find that the curdling is much more profound after the milk had been heated. Maybe there's some temperature to balance the two aspects? Let me know as you continue to experiment, and good luck!